Clean contemporary lines combined with generous seating make this reclining sectional a destination for comfort. Sink back and relax in deep cushioning while a chaise seat provides one continuous reclining surface for added leg support. 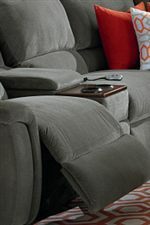 Also includes arms with storage compartments for remote controls and built-in cupholders. Sectional displays a casual, contemporary look with saddlebag arms, plump, knife-edged back cushion, and topstitch detailing. The ASPEN Five Piece Reclining Home Theather Group by La-Z-Boy at AHFA in the area. Product availability may vary. Contact us for the most current availability on this product. 40S723 Armless Recliner 1 32.5" 39.5" 40"
40A723 Left-Arm Sitting Recliner 1 42" 39.5" 40"
40B723 Right-Arm Sitting Recliner 1 42" 39.5" 40"
4CN723 Narrow Wedge Console 2 15.5" 37.5" 34.5"
The ASPEN collection is a great option if you are looking for Contemporary Casual furniture in the area. Browse other items in the ASPEN collection from AHFA in the area.